Cotton quilt made from squares of patterned and plain materials. It has a mauve cotton flounce around the border and a mauve cotton backing. There is no padding. 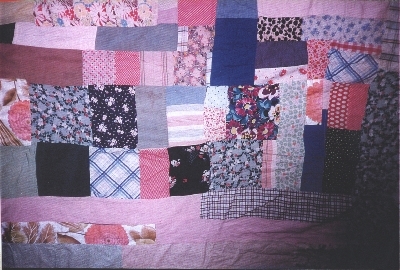 The quilt was made by Maud Brown at Emu Flat, Binalong NSW in 1930. Maud was the daughter-in-law of Amelia Brown. It has always been in the Brown family and is owned by Maud's daughter Una Braby. It is not used. Maud was the daughter-in-law of Amelia Brown who was born in Devon England, married John Brown in 1836 and came to Australia in 1857. 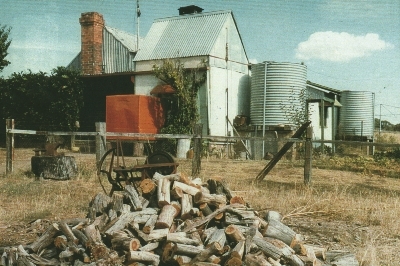 They settled in the Yass district. Una Braby, the present owner, is one of Maud's 3 daughters. Side of the house at Emu Flat where the quilt was made.